Previous chapters have described the fragmentation of the Western Australian wheatbelt environment over the past one hundred years. 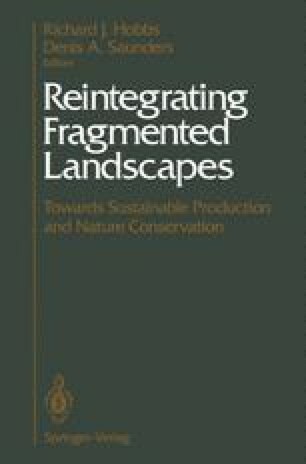 Ecological disintegration has been apparent in the form of the extinction of plants and animals (Hobbs et al., Chapter 4), the loss of topsoil and decline in soil properties (Nulsen, Chapter 5), and an annual increase in the area of land affected by salinity (McFarlane et al., Chapter 6). Social disintegration has been apparent in the last third of that period, with a decline in populations in small towns to the point of collapse of the social infrastructure (B.Y. Main, Chapter 3). In economic terms, however, agricultural land use in the region as a whole has remained viable over this period. This viability has been maintained partly at the expense of social values through the amalgamation of family farm businesses. The trend toward further amalgamation, which saw an eightfold increase in the amount of farmland controlled per farmer in the 50 years up to 1971 in Australia generally, continues (Mauldon and Schapper 1974; Australian Bureau of Statistics 1990). The primary cause of the social disruption of farm amalgamation has been the long-term decline in the terms of trade in agriculture; the prices received for farm produce have been increasing at a slower rate than the costs of inputs. …if the farm is to last and remain in health, the wilderness must survive within the farm. That is what agricultural fertility is: the survival of natural process in the human order.